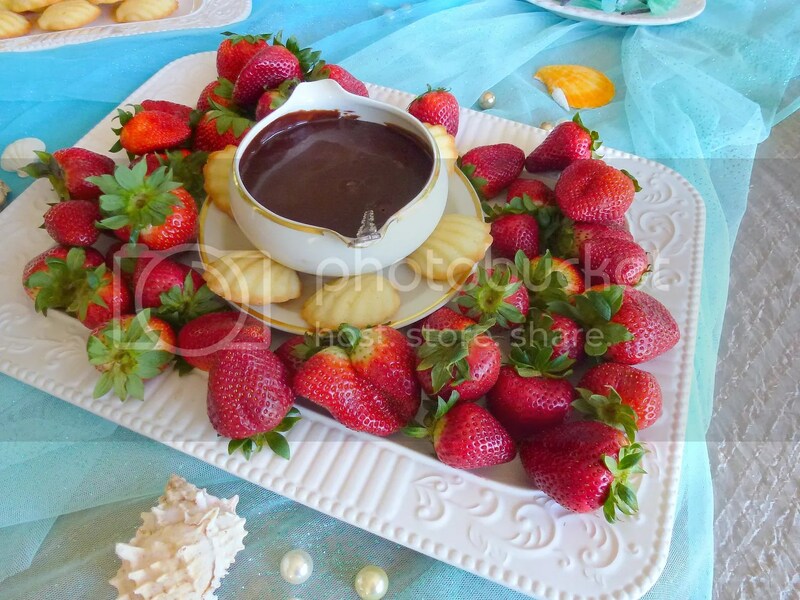 A Mermaid Bridal Shower… | The Happy Wonderer ~ ellen b. We are blessed this year with weddings in March, April and May! 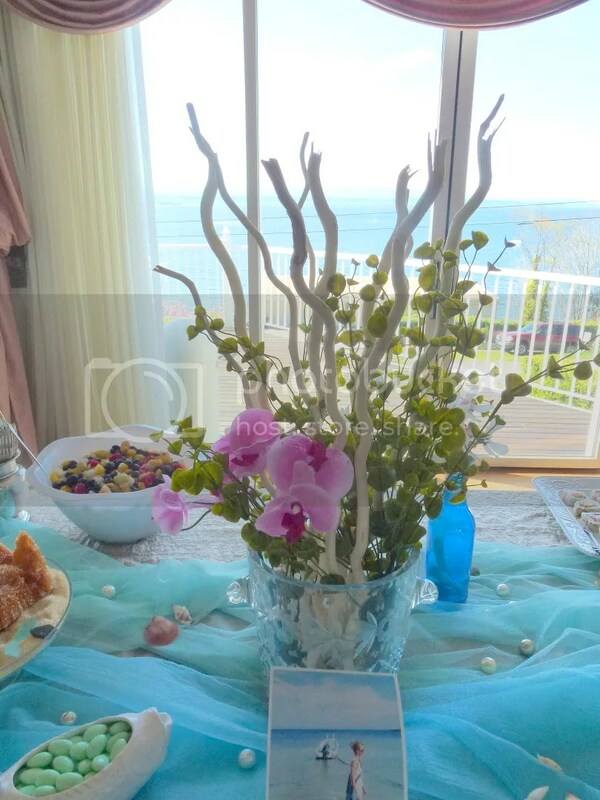 Saturday past I was honored to attend the Mermaid Bridal Shower for our dear friend Lucy. Lucy’s sister Bridget carried out the theme beautifully as you will see in my photos. Lucy’s youngest sister Jamie was our Katie’s Maid of Honor. Dear and I became friends with Lucy’s parents when we all lived in Ventura, California. Lucy’s father delivered our daughter Katie in Ventura in 1985. Lucy’s mom Jody has been a really good friend and walking buddy to me for many years. We thank God for our friendship. 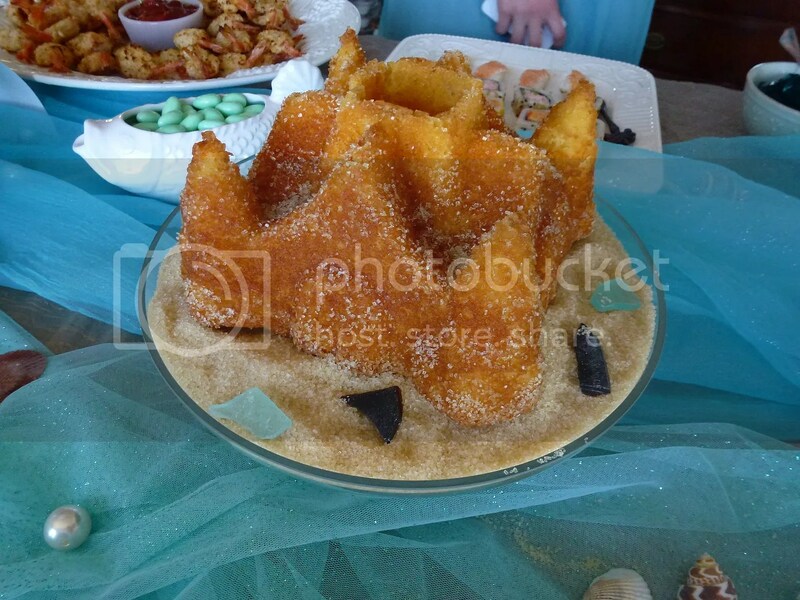 The mermaid/sea theme was great with shrimp and sushi and a sand castle cake. 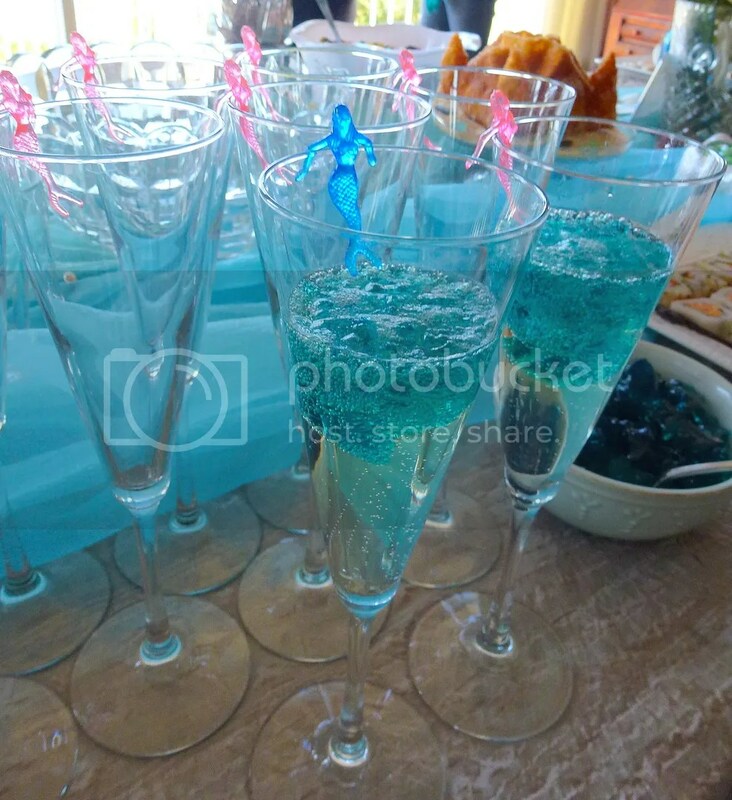 See the little mermaids dangling on the champagne flutes? 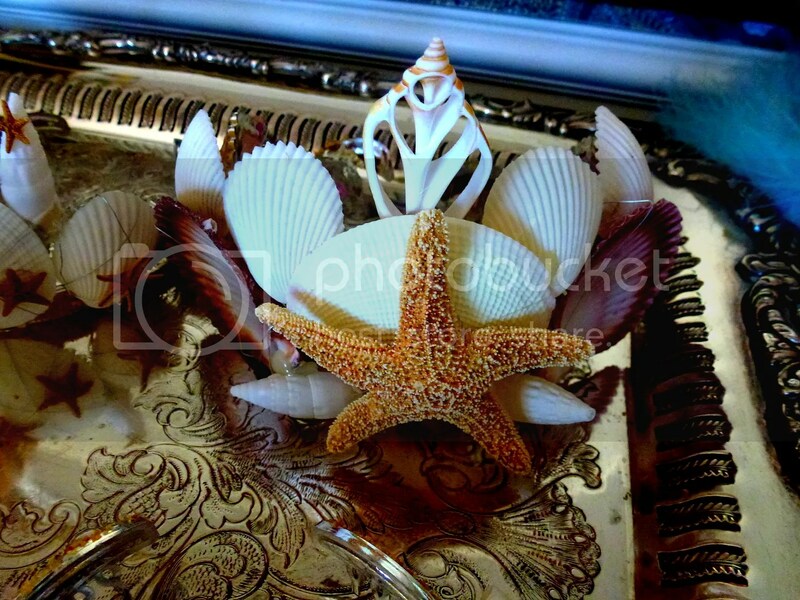 Bridget made these seashell tiaras to use for photos with all the guests. 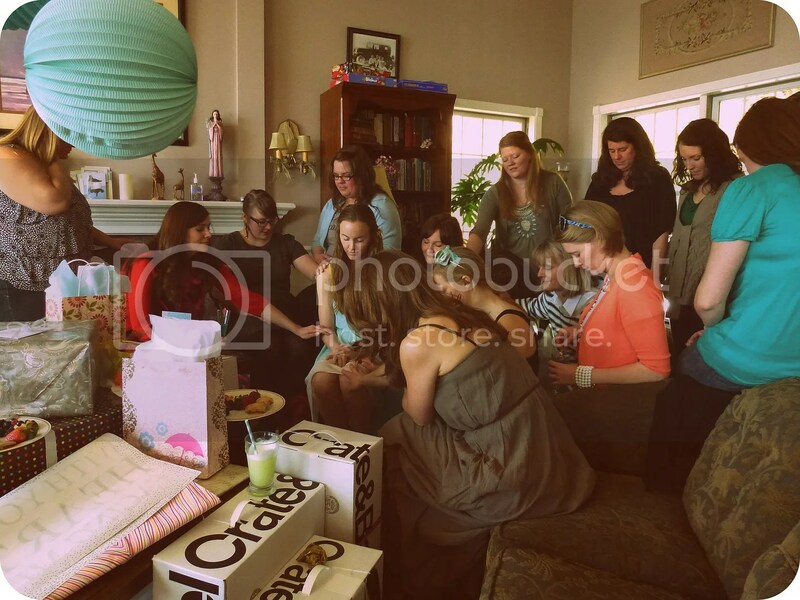 How wonderful to take the time to pray over the bride for her and her groom at the bridal shower. Our hostess Bridget with the guest of honor Lucy and our DIL Laura. Our son Josh and our DIL Laura are standing on Lucy’s side at the wedding along with Bridget and her husband and Lucy’s youngest sister Jamie. I really like that idea of having people that are close to you as couples or singles standing with you. 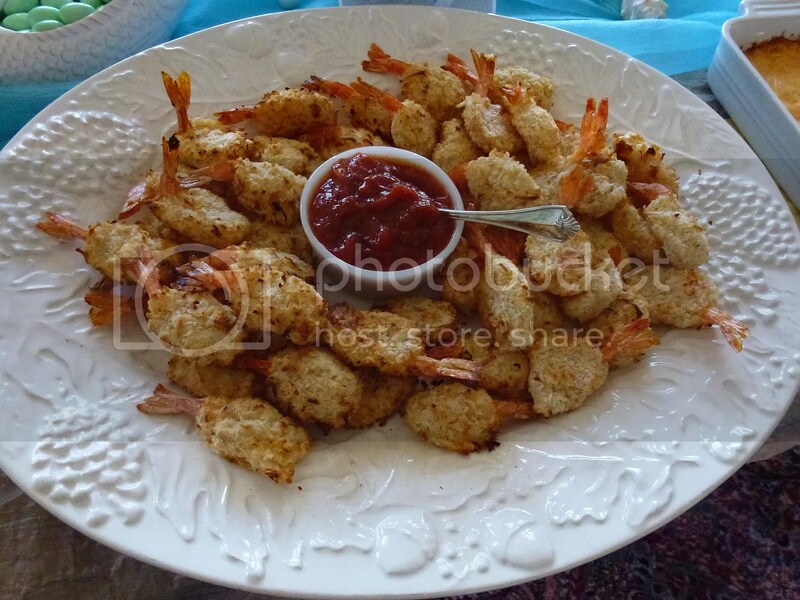 I’m linking up with Kathleen at Cuisine Kathleen for Let’s Dish. Let’s Dish comes on line at 7:00 P.M. on Wednesday nights. 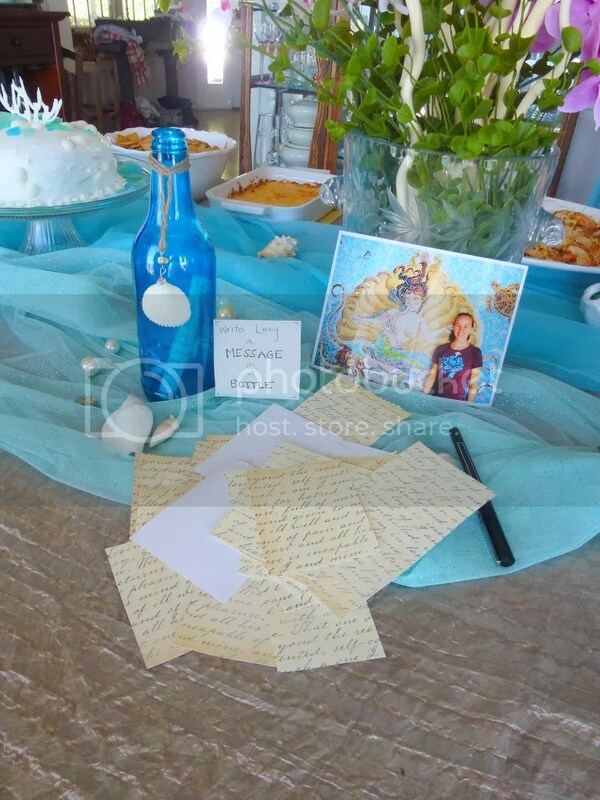 Posted on April 11, 2012 by Ellen •	This entry was posted in Wedding Shower and tagged Bridal Shower, Friends, Mermaids. Bookmark the permalink. Those tiara’s are amazing….how fun. I’m with you on the bridal attendants – years down the road those people will still be close, whereas casual friends will have moved on. WOW! What an incredible shower. I love how the theme is carried out to the littlest detail. Wow! A lot of work went into that special event! Some really neat ideas! 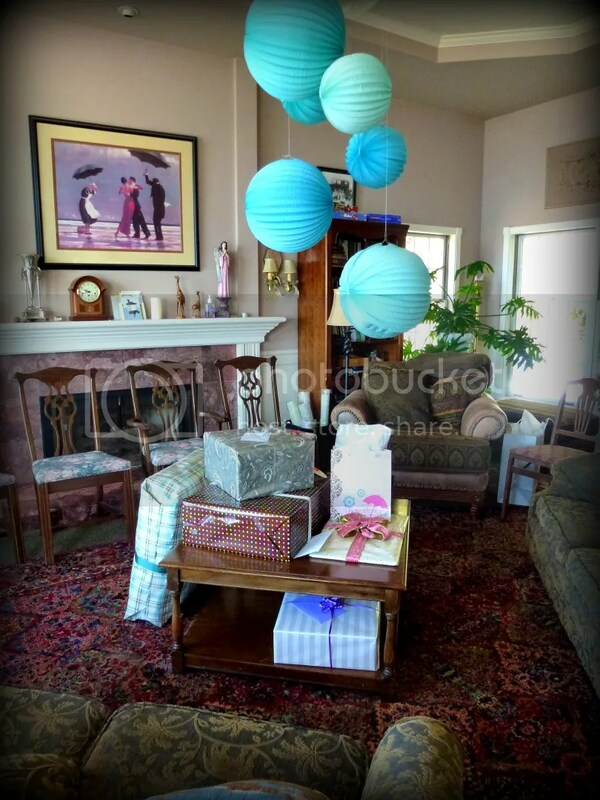 What a fun theme…and carried out so well! So many neat ideas. That’s a great theme! This wedding thing you’ve got going on…pretty interesting! What a beautiful idea for a shower, carried out to perfection. 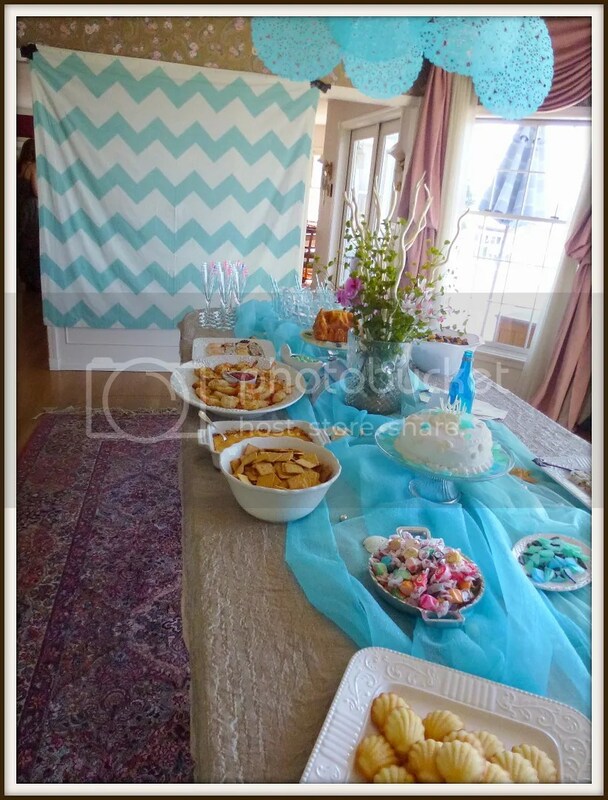 What a fun theme for a shower! 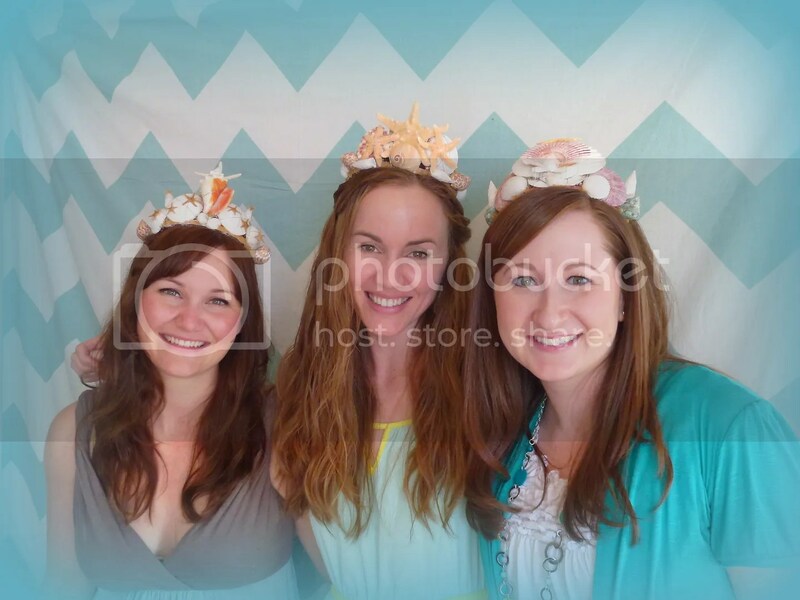 I love the idea of the seashell tiaras! Very cool theme, decorations, food, and attendants! I am truly in love with that theme…the table is absolutely stunning and so much fun..and then there is the view…stunning….what a great shower! What an incredibly cute theme! It’s all done to a T, especially with the tiaras! My goodness….that must have taken time, skill and a whole lot of patience!!! They turned out great! I thought they were candy at first! That sand castle cake is a clever addition to the table, and I just can’t get over those little mermaids clinging on to the flutes!!!!!! 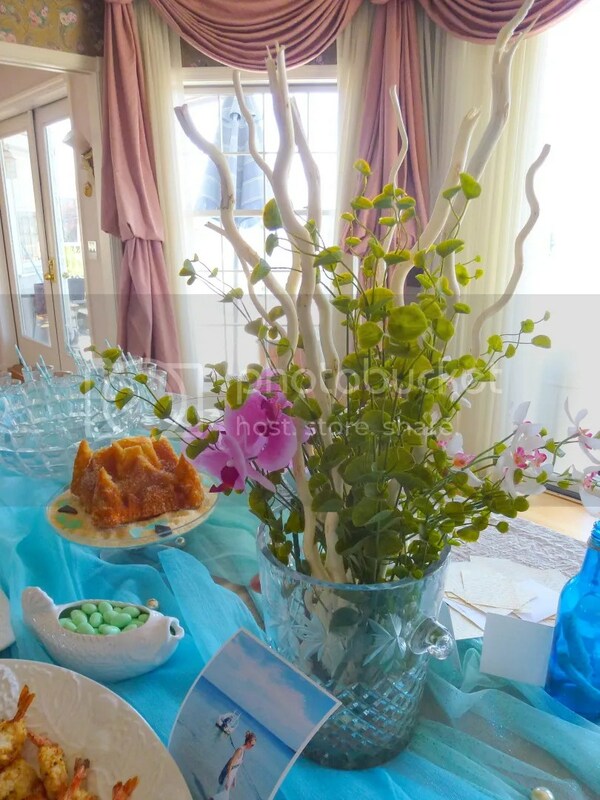 Whoever thought to do that centerpiece like that deserves a hand, too. Very, very well done! The ladies look beautiful in their tiaras! Love the “message in the bottle” idea too! This is great! Wonderful idea, and the colors really pop! So many cute details! Message in the bottle, very clever! The mermaids on the glasses are adorable! God bless the new couple, love the prayer! 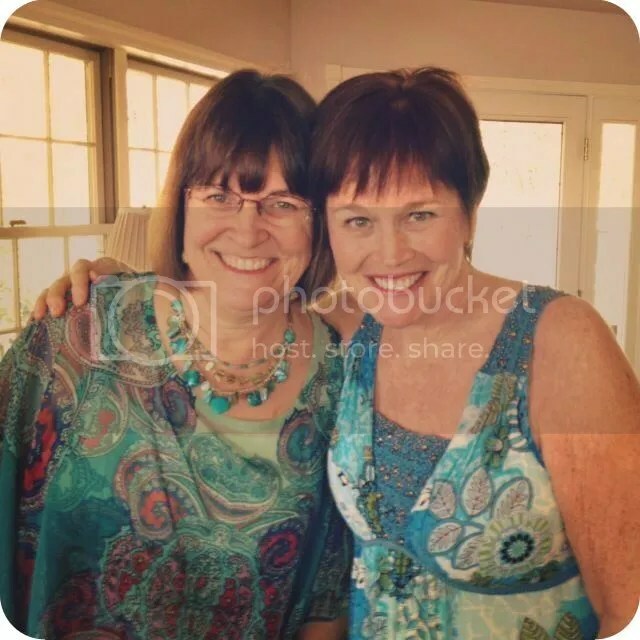 Thanks for linking this creative post to Let’s Dish! I’m such a theme party fan,and I really love this. I love how they kept to the theme, and all the “mermaid blue” is perfect as well as the shell crowns. My favorite part of all is the prayer time over the new couple. What a blessing! 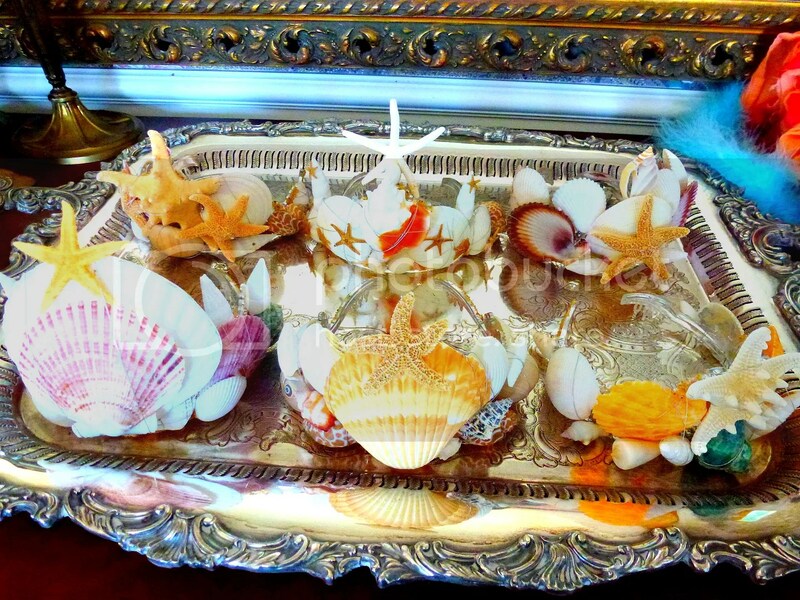 I ♥♥♥ the sea theme…and those lounging mermaids are a hoot! 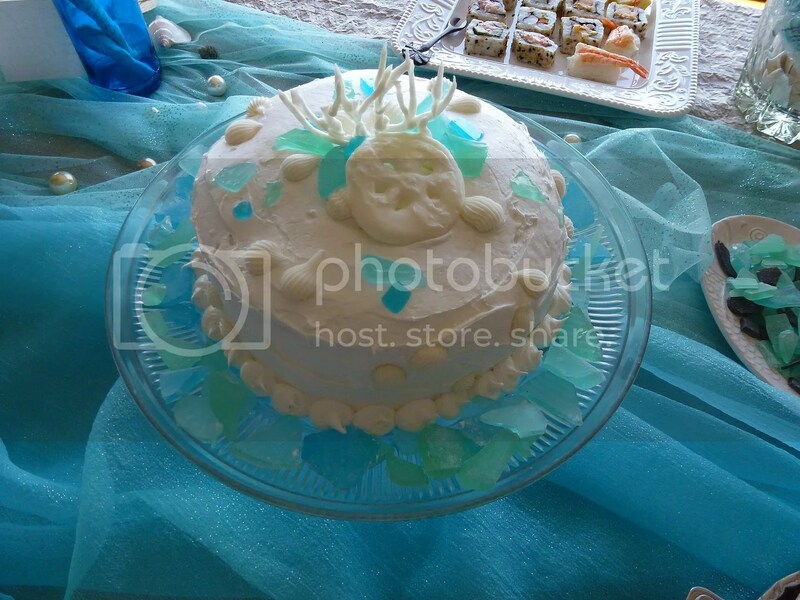 The cake is really pretty with the aqua sea glass. Thanks for sharing, Ellen. I love that mermaid theme! And it was carried out so beautifully! What a fun theme! 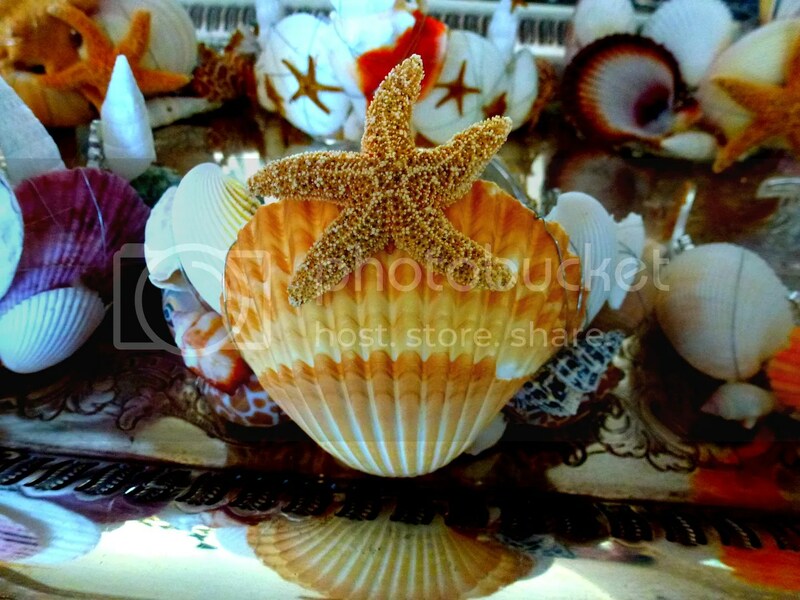 Everything is so pretty and I love the shell crowns! 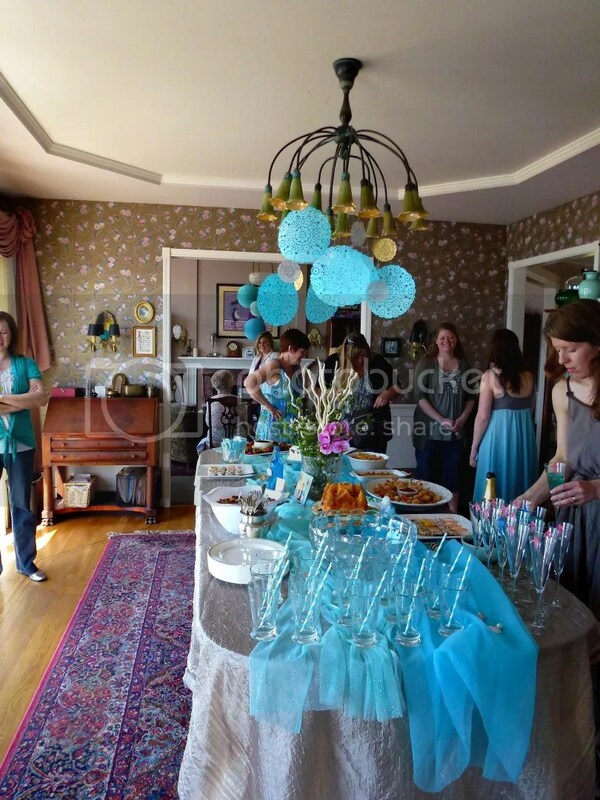 What a wonderful theme for a shower – so many creative ideas and the turquoise is beautiful! what better way to bless a bride than to pray God’s blessings over her. I’m sure that will be the most memorable part of the shower. What a beautiful event and such love that went into making it perfect. The bride is truly blessed to have someone who wanted to do this for her. I love all the details, like the little mermaids and the tiaras, and the food looks scrumptious! 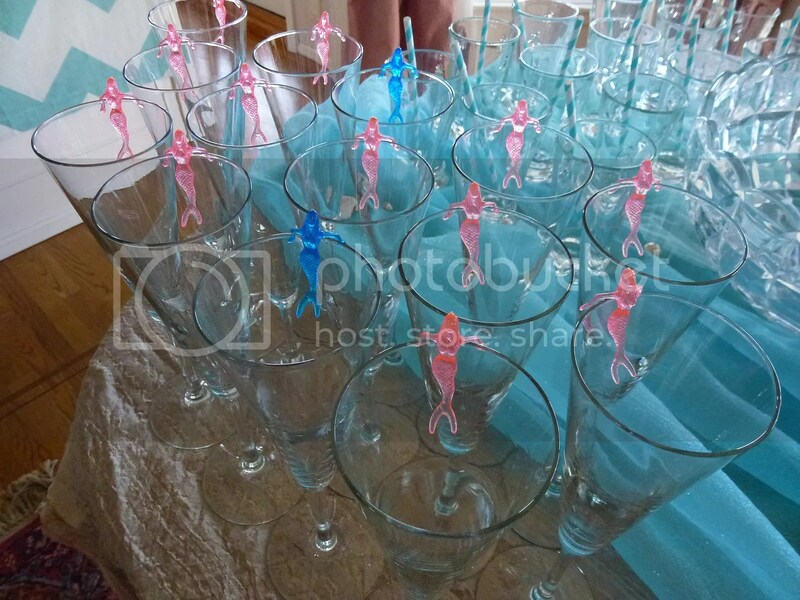 I love the Mermaids on the Champagne flutes. Where can I find them?? Elizabeth, I’m sorry that I don’t know where the planners of the party bought them. You might try googling… or a party supply store. 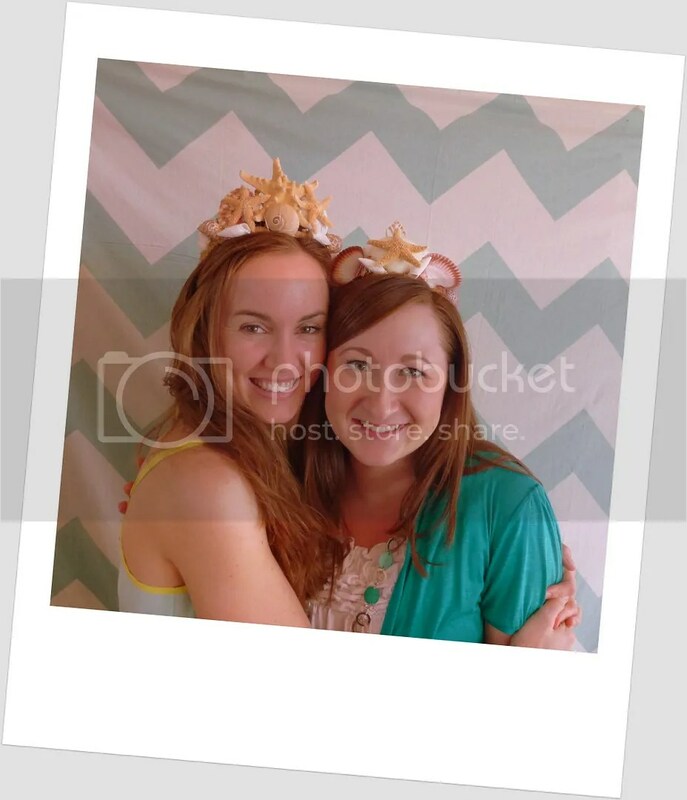 Pingback: Fin Fun Blog | More from the mermaid experts at Fin Fun Mermaid!